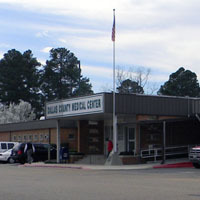 Dallas County Medical Center: Board of Governors. Mrs. Hart is the co-owner of Hart & Co. of Fordyce, Inc, a local Fordyce business. Mr. Harris is owner of Harris Timberland, a local Fordyce business. Mr. Daniel is retiree from the Alltel Corporation and a local minister. B. D. Hargett is the President of Fordyce's branch of Heartland Community Bank. Mr. Kauffman works for Benton Funeral Home in Fordyce. Mr. Brewer is employed by Millcreek of Arkansas, Inc.